LeBASQUE and wife, sons 2. Francois MOYSE and wife, sons 1. Widow RICHARD, sons 4, daughters 2. ARISIEN and wife, sons 3, daughters 1. DUBOIS and wife, sons 1. Rene FORET and wife, sons 5, daughters 5. Alexandre HEBERT and wife, sons 1. Pierre de BEAUPRE and wife, sons 1. Rene de BEAUPRE and wife, daughters 1. Michel de BEAUPRE and wife, son 1. Claude THIBODEAU and wife, sons 1, daughters 2. Charles LANDRY and wife, sons 1, daughters 2. Francois GIROUARD and wife, sons 2, daughters 1. Claude GIROUARD and wife, daughters 1. Widow NANTAIS, sons 2, daughters 1. Jacques GIROUARD and wife, sons 1, daughters 4. Alexandre GIROUARD and wife, sons 1, daughters 4. Guillaurme GIROUARD and wife, daughters 1. MARIN and wife, sons 8, daughters 1. Etienne MARTIN and wife, sons 2, daughters 1. Antoine THIBODEAU and wife, sons 1, daughters 5. Michel HIBODEAU and wife, sons 4, daughters 2. Rene BLANCHARD and wife, sons 3. La ROSSETTE and wife, 3 sons, 2 daughters. Abraham COMMEAU and wife, 2 sons, 5 daughters. Claude PITRE and wife, 2 sons, 6 daughters. Pierre COMMEAU and wife, 4 sons, 3 daughters. Joseph COMMEAU and wife, 1 daughter. Pierre MARTIN and wife, 1 daughter. Pierre MARTIN, Jr. and wife, 8 sons, 3 daughters. Baptiste PELLERIN and wife, 1 son, 1 daughter. Le BRETON and wife, 8 sons, 2 daughters. Francois PITRE and wife, 2 sons, 2 daughters. Pierre GODET and wife, 3 sons, 2 daughters. Bertrand GODET and wife, 2 sons, 4 daughters. Antoine HEBERT and wife, 2 sons, 7 daughters. LIONNAIS and wife, 1 son. Widow BOURGEOIS, 2 sons, 4 daughters. Guillaume BOURGEOIS and wife, 1 son, 1 daughter. Pierre COMMEAU and wife, 2 sons, 2 daughters. Jean COMMEAU and wife, 2 sons, 5 daughters. RICHARD and wife, 3 sons. BROUSSARD and wife, 5 sons. Pierre LeBLANC and wife, 4 sons, 3 daughters. Francois ALLARD and wife, 1 son, 2 daughters. LAFONT and wife, 2 sons, 1 daughter. La BAUVE and wife, 2 sons, 5 daughters. Jean EMMANUEL and wife, 3 sons, 2 daughters. Guillaume BLANCHARD and wife, 2 sons. Pierre LANOUE and wife, 5 sons. Jean DUPUIS and wife, 3 sons, 4 daughters. Antoine BLANCHARD and wife, 1 son, 2 daughters. Germain SAVOYE Sr. and wife, 4 sons, 1 daughter. Germain SAVOYE Jr. and wife, 3 sons. Houel DENIS and wife, 1 daughter. Rene BARNABE and wife, 7 sons, 2 daughters. Widow ABRAHAM, 2 sons, 4 daughters. Antoine BRUN and wife, 2 sons, 2 daughters. Claude BRUN and wife, 1 son, 1 daughter. Jean BRUN and wife, 1 son, 1 daughter. Marc PITRE and wife, 2 sons, 2 daughters. Widow BREAU, 1 son, 1 daughter. Jean BREAU and wife, 3 sons, 3 daughters. BEAUMONT and wife, 1 son, 3 daughters. Alexandre COMMEAU and wife, 1 son, 2 daughters. Maistre JEAN and wife, 3 sons, 4 daughters. Laurent DOUCET and wife, 7 sons, 2 daughters. Jacques NANTAIS and wife, 1 son, 2 daughters. RAIMOND and wife, 3 sons, 1 daughter. Charles DONAT and wife, 8 sons, 1 daughter. MAILLARD and wife, 3 sons, 3 daughters. Charles BOUDROT and wife, 1 son, 3 daughters. VILATTE and wife, 1 son, 2 daughters. PELLERIN, Sr. and wife, 2 sons, 1 daughter. SURETTE and wife, 2 sons. Charles LANDRY and wife, 3 sons, 1 daughter. Pierre LANDRY, widower, 4 sons. Prudent ROBICHAUX and wife, 5 sons, 5 daughters. Francois ROBICHAUX and wife, 2 sons, 3 daughters. SAINT-MICHEL and wife, 6 sons, 4 daughters. Louis ALLAIN and wife, 1 son, 1 daughter. Charles CADET and wife, 8 sons, 2 daughters. SAMSON and wife, 3 sons, 2 daughters. BLONDIN and wife, 3 sons, 2 daughters. Jean BELIVEAU and wife, 2 sons, 4 daughters. BIDEAU and wife, 2 sons, 3 daughters. GENTIL and wife, 1 daughter. Jacques GOUSILLE and wife, 1 son, 3 daughters. LANGLOIS and wife, 2 sons, 3 daughters. Maurice VIGNEAU and wife, 3 sons, 2 daughters. LaPIERRE and wife, 1 son, 3 daughters. CHAMPAGNE or ORILLON and wife, 2 sons, 2 daughters. Abraham DUGAST and wife, 4 sons, 2 daughters. DAMBOISE and wife, 3 sons, 3 daughters. Rene GRANGER and wife, 5 sons, 3 daughters. Francois BOUDROT and wife, 6 sons, 2 daughters. SAINT-LOUIS and wife, 1 son, 3 daughters. LaVERGNE and wife, 1 son, 3 daughters. BONAPPETIT , or LaLANDE, and wife, 2 sons, 2 daughters. Pierre SIMON and wife, 2 sons, 3 daughters. Charles de PONBOMCOUP and wife, 1 daughter. Baptiste LANDRY and wife, 1 daughter. Claude LANDRY and wife, 1 son. PARIS and wife, 2 sons, 2 daughters. Francois CROSS and wife, 4 sons, 2 daughters. Mer SAINT-SCENE and wife, 2 daughters. SAINT-SCENE and wife, 1 son, 1 daughter. POTIER and wife, 2 sons, 1 daughter. Abraham BOURC and wife, 4 sons 1 daughter. Claude GRANGE and wife, 3 sons, 1 daughter. Laurent GRANGE and wife, 2 daughters. Rene DOUCET and wife, 1 son, 3 daughters. Alexandre RIBICHOC and wife, 1 son, 5 daughters. LaLIBERTE and wife, 4 sons, 2 daughters. Charles MELANSON and wife, 2 sons, 1 daughter. Ambroise MELANSON and wife, 4 sons, 3 daughters. Widow BELIVEAUX, 3 sons, 1 daughter. Pierre MELANSON and wife, 1 daughter. Charles GUILLEBEAU and wife, 4 sons, 3 daughters. Bernard BOURC and wife, 1 son, 3 daughters. Abraham BOURC and wife, 1 son, 1 daughter. Claude DUGAS and wife, 4 sons, 5 daughters. DELAURIER and wife, 3 sons, 1 daughter. Bernard DELAURIER and wife, 1 daughter. CLEMENCEAU and wife, 1 son, 3 daughters. Jacques CORNE and wife, 2 daughters. Alexandre RICHARD and wife, 4 sons. Mathieu DOUCET and wife, 1 son. LaMONTAGNE and wife, 3 sons, 3 daughters. Alexandre LaMONTAGNE and wife, 1 son, 4 daughters. Pierre BROUSSARD and wife, 2 sons, 1 daughter. Clement VINCENT and wife, 2 sons, 3 daughters. YVON and wife, 1 son, 1 daughter. Jacques LaMONTAGNE and wife, 1 son, 1 daughter. Abraham DUGAS and wife 1 son. Jean DOUARON and wife, 1 daughter. Joseph DUGAS and wife, 2 sons. Jean LeBLANC and wife 3 sons, 1 daughter. Jean LeBLANC and wife, 5 sons, 3 daughters. Andre LeBLANC and wife, 4 sons, 2 daughters. Pierre LeBLANC and wife, 1 daughter. Germain TERRIOT and wife, 2 daughters. Jacques TERRIOT and wife, 1 son. Mathieu BRASSEUX and wife, 2 sons, 3 daughters. Antoine LeBLANC and wife, 4 sons, 2 daughters. Charles LeBLANC and wife, 3 daughters. Pierre LeBLANC and wife, 2 daughters. Jean MOUTON and wife, 1 son. Claude LANDRY and wife, 1 daughter. Claude TERRIOT and wife, 2 daughters. Rene RICHARD and wife, 1 son, 1 daughter. Widow PERRINE, 2 sons, 1 daughter. JASSEMIN and wife, 1 son, 1 daughter. Francois GAUTEREAU and wife, 1 son, 1 daughter. Rene BOANCHARD and wife, 3 sons, 2 daughters. Martin AUCOIN and wife, 2 sons, 4 daughters. Francois LeBLANC and wife, 1 son. Pierre LeBLANC and wife, 1 son. Charles BABIN and wife, 6 sons, 2 daughters. Rene LeBLANC and wife, 2 sons, 1 daughter. Jacques LeBLANC and wife, 3 sons, 4 daughters. Jean DOUCET and wife, 2 sons, 3 daughters. Jean TERRIOT and wife, 1 daughter. Pierre RICHARD and wife, 5 sons, 2 daughters. Jacques GRANGE and wife, 4 sons, 2 daughters. Pierre GRANGE and wife, 2 sons, 5 daughters. Pierre VINCENT and wife, 3 sons, 4 daughters. Jean THIBODEAU and wife, 4 sons, 2 daughters. Rene LeBLANC and wife, 6 sons, 2 daughters. Alexandre BOURC and wife, 2 sons, 7 daughters. Pierre MELANSON and wife, 2 sons, 4 daughters. Jacques HEBERT and wife, 2 sons, 3 daughters. Guillaume HEBERT and wife, 1 son, 1 daughter. Philippe MELANSON and wife, 2 sons, 5 daughters. Jean MELANSON and wife, 3 sons, 2 daughters. Michel HEBERT and wife, 5 sons, 7 daughters. Jean LANDRY and wife, 3 sons, 3 daughters. Charles GAUTEREAU, widower, 2 sons, 5 daughters. Widow DUPUIS, 3 sons, 7 daughters. Charles GAUTREAU and wife, 1 son. Claude GAUTEREAU and wife, 1 son. Claude GAUTEREAU and wife, 3 sons, 5 daughters. Charles BOUDROT and wife, 4 sons, 5 daughters. Jean BOUDROT and wife, 3 sons, 2 daughters. Charles BOUDROT and wife, 1 son. Etienne RIVET and wife, 2 sons, 1 daughter. Michel VINCENT and wife, 3 sons, 5 daughters. Pierre BRASSEUR and wife, 1 son, 7 daughters. Pierre FORET and wife, 2 sons, 6 daughters. Etienne COMMEAU and wife, 1 son, 3 daughters. Jean DOUARON and wife, 4 sons, 3 daughters. Martin CORPORON and wife, 1 son, 3 daughters. Rene BOUDROT and wife, 1 son 3 daughters. Vincent BABIN and wife, 4 sons, 6 daughters. Pierre LANDRY and wife, 1 daughter. Clement BENOIT and wife, 2 sons, 3 daughters. Michel FORET and wife, 4 sons, 4 daughters. Pierre BENOIT and wife, 3 sons, 2 daughters. Pierre LANDRY and wife, 3 sons, 2 daughters. Abraham LANDRY and wife, 6 sons, 1 daughter. Antoine BREAU and wife, 4 sons, 3 daughters. Francois LePRINCE and wife, 1 son. Jean MARTIN and wife, 2 sons, 7 daughters. Alexandre TRAHAN and wife, 8 sons, 5 daughters. Antoine LePRINCE and wife, 1 daughter. Pierre THIBODEAU and wife, 7 sons, 3 daughters. Pierre LeJEUNE and wife, 3 sons, 3 daughters. Jean ROY and wife, 1 daughter. Baptiste LANDLRY and wife, 1 son. Charles CHAUVERT and wife, 3 sons, 3 daughters. Charles DOUARON and wife, 5 daughters. Louis DOUARON and wife 1 daughter. Bernard DAIGRE and wife, 8 sons, 2 daughters. Martin BENOIT and wife, 1 daughter. Germain LANDRY and wife, 6 sons, 3 daughters. Francois BODART and wife, 2 daughters. Jean BABIN and wife, 2 sons, 2 daughters. Pierre BENOIT and wife, 4 sons, 3 daughters. Guillaume TRAHAN and wife, 6 sons, 1 daughter. Denis BOUDROT and wife. 2 sons. Pierre LeJEUNE and wife, 1 son. Joseph BOUTIN and wife, 3 sons. Jean HEBERT and wife, 4 sons, 5 daughters. Rene LANDRY and wife, 1 son. Francois Michel and wife, 3 sons, 4 daughters. Pierre GIROUARD and wife, 6 sons, 2 daughters. Nicolas BARILLOT and wife, 4 sons. Charles DOUARON and wife, 1 daughter. Isabelle BOURG, widow GODET, 2 sons, 1 daughter. Antoine DUPUIS and wife, 1 daughter. Louis SIRE and wife, 1 daughter. Augustin HEBERT and wife, 1 son. Rene HEBERT and wife, 3 sons, 1 daughter. Claude BOUDROT and wife, 5 sons, 4 daughters. Antoine LANDRY and wife, 2 sons, 1 daughter. Claude BENOIT, 2 sons. Jerome DAROIS and wife, 1 son, 3 daughters. Michel BOUDROT and wife, 1 son, 3 daughters. Claude BOUDROT and wife, 1 son, 1 daughter. Joseph HEBERT and wife, 1 son, 5 daughters. Jacques LeBLANC and wife, 2 sons. Claude LANDRY and wife, 1 son, 5 daughters. Antoine LeBLANC and wife, 3 sons, 2 daughters. Widow HEBERT, 2 sons, 2 daughters. Joseph BOUDROT and wife, 1 daughter. Widow of Etienne HEBERT, 3 sons, 1 daughter. Jean COMMEAU and wife, 4 sons, 6 daughters. Claude TERRIOT and wife, 3 sons, 2 daughters. Rene AUCOIN and wife, 1 son. Pierre BREAU and wife, 3 sons, 5 daughters. Francois BREAU and wife, 3 sons, 3 daughters. Jean TERRIOT, widower, 3 sons, 5 daughters. Pierre THIBODEAU and wife, 2 sons, 3 daughters. Rene LANDRY and wife, 6 sons, 3 daughters. Jean TRAHAN and wife, 5 sons, 4 daughters. Louis SAUNIER and wife, 5 sons, 5 daughters. Widow LAROCHE, 2 sons, 3 daughters. Marcel SAUNIER and wife, 2 daughters. Jean BOURQ and wife, 1 son, 3 daughters. Pierre BOURQ and wife, 4 sons. Abraham BOURQ and wife, 2 sons, 3 daughters. Jean BOURCQ and wife, 4 sons, 3 daughters. Michel HACHE and Anne CORMIER: Joseph, Marie, Jean-Baptiste, Charles, Pierre, Anne, Marguerite, Francois, Madeleine, Jacques. Michel HACHE Jr. and Madeleine LeBLANC: Marie, Michel. Pierre CORMIER and Catherine LeBLANC: Pierre, Marie, Jean-Baptiste, Madeleine, Michel, Catherine. Jean-Baptiste POIRIER and Marie CORMIER: Marie, Joseph, Anne. Pierre POIRIER and Agnes CORMIER: Pierre, Bernard, Michel, Guillaume. Germain CORMIER and Marie LeBLANC: Pierre, Marie, Marguerite, Anne, Germain. Philippe LAMBERT and Marie BOUDROT: Marie. 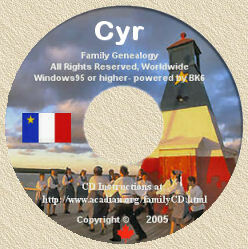 Francois CORMIER and Marguerite LeBLANC: Pierre, Anne, Catherine, Cecile, Paul, Francois, Joseph. Michel POIRIER and Marie BOUDROT: Francois, Jacques, Joseph. Paul BOUDROT, orphan. Francois DOUCET and Marie KESSIS: Francois, Michel, Anne, Pierre, Marguerite, Madeleine. Michel BOURQ and Elisabeth MELANSON: Francois, Pierre, Anne, Elisabeth, Joseph, Jean-Baptiste, Alexandre. Claude BOURGEOIS and Anne BLANCHARD: Marie, Paul, Claude, Joseph, Michel. Martin RICHARD and Marguerite BOURQ: Alexandre, Michel, Marie, Marguerite, Joseph, Madeleine, Pierre. Martin RICHARD and Marie CORMIER: Marie. Pierre DOUARON and Madeleine DOUCET: Jean-Baptiste, Anne, Marguerite, Joseph, Michel, Paul, Pierre. Louis DOUCET and Marguerite GIROUARD: Pierre, Madeleine, Louis, Marguerite, Marie. Michel POIRIER and Madeleine BOURGEOIS: Michel, Jean-Baptiste, Marie, Joseph, Ambroise, Pierre, Anne. Alexis CORMIER and Marie LeBLANC: Madeleine, Pierre, Marguerite, Agnes, Jean-Baptiste, Anne. Widow ARSENAUT: Jacques, Francois, Claude, Abraham, Augustin. Guillaume SIRE and Marguerite BOURQ: Michel, Jean, Pierre and the widow Marie GIROUARD. Pierre SIRE and Claire CORMIER: Marie, Anne, Marguerite, Pierre, Jean, Jacques. Gabriel CHIASSON, widower: Marie Joseph, Francois, Abraham, Francoise, Anne, Marguerite, Judith. Jean KESSY and Marie POIRIER: Marie. Michel POIRIER and Marie CHIASSON: Michel, Marie, Cecil, Francois, Madeleine, Joseph, Pierre, Marguerite. Pierre GODET and Anne BLANCHARD. Louis POIRIER and Cecile MIGNAUT: Marie, Jean, Jeanne, Catherine, Marguerite. Abraham GODET and Marie Breau: Pierre, Anne, Marie, Paul. Pierre ARSENAUT and Anne BOUDROT: Pierre, Charles, Anne, Francois, Jean, Marguerite, Jacques. Pierre HEBERT and Marie-Joseph BLOU: Jean, Marguerite, Marie, Pierre, Joseph. Jacques HEBERT and Jeanne GAUTROT: Jacques, Marie, Pierre. Mr. MAISONNAT and Marguerite BOURGEOIS: Louis, Alexis, Judith, Marie, Mariane. Jean KESSIS and Cecile HEBERT: Anne, Jean, Marie, Jacques, Brigette. Pierre KESSIS and Therese MIRANDE: Michel, Cecile, Joseph, Anne. Abraham ARSENAUT and Jeanne GODET: Marie, Jean-Baptiste, Pierre, Francoise, Paul, Marguerite, Anne, Jeanne, Madeleine. Jean SIRE and Francoise MELANSON: Marie, Pierre, Paul, Michel, Marguerite, Anne, Jean, Francoise. Pierre CARRE and Angelique CHIASSON: Marie, Marguerite, Pierre, Anne, Madeleine, Jacques. Michel DEVEAU and Marie-Madeleine MARTIN: Pierre, Cecile, Jean-Jacques, Augustin. Francois LaPIERRE and Marie BLOU: Jacques, Michel, Marie-Joseph. Claude GODET and Marguerite BLOU: Pierre, Cecile, Marguerite, Marie-Joseph, Madeleine, Claude. Widow BLOU. Germain GIROUARD and Jeanne BARILLOT: Michel, Marguerite, Francois. Charles BOURGEOIS and Marie BLANCHARD: Jeanne, Charles, Pierre, Honore, Michel, Jean-Baptiste, Jacques, Madeleine, Anne. Jean FOREST and Elisabeth LaBARRE: Jacques, Alexandre, Jean-Joseph, Marguerite, and two other children. Joseph MIRANDE and Marie GODET: Pierre, Baptiste, Paul, Marie, Charles. Michel KESSIS and Madeliene GODET: Joseph, Anne-Marie, Madeleine. Rene BERNARD and Anne BLOU. Augustin GODET and Agnes CHIASSON. Antoine GODET and Marie BOURQ: Marie. PASCHALIN, orphan. Charles ARSENAUT and Francoise MIRANDE: Charles. Jacques OUDY and Cecile BLOU: Claude, Cecile. Francois LaBAUVE and Madeleine BLOU: Francois. Jean-Baptiste VECO and Marie CHIASSON. Michel BOURQ and Marie CORMIER. Jean-Baptiste Chiasson and Medeleine BOUDROT. Germain GIROUARD and Marie DOUCET: Germain, Marie-Madeleine. Jean-Jacques NUIRAT and Marie BOURGEOIS: Cecil.